Image credit: Lakewood Brewing Co. (click to see full-size version). 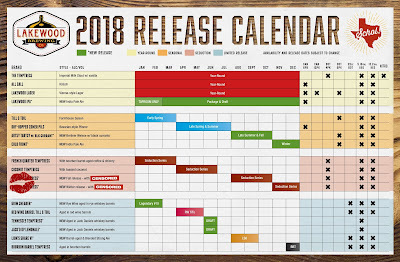 Now entering its sixth year in business, Lakewood Brewing Co. (LBC) has announced a number of modifications to its craft beer lineup. The turnover includes the departure of a number of local favorites, including at least one of Lakewood's original brews. Retired beers include the year-round offerings Hop Trapp, Hopochondria, and Goatman, as well as seasonal beers Punkel and Holiday Bonus. In their place, Lakewood IPA (7% ABV) joins the year-round lineup, while Artsy Tartsy with Black Currants and Cold Front IPA will being added as late summer/fall and winter seasonals, respectively. As for the Seduction Series, three beers from that line are being retired (for now) – Raspberry Temptress, Mole Temptress, & Sin Mint Temptress. Two new variants will be introduced later this year, the names and ingredients of which are currently being kept under wraps. Among other things to come, Grim Shearer, the third and final beer in the Three Fates mini-series, is a unique rye wine aged in rye whiskey barrels that will arrive in late January. 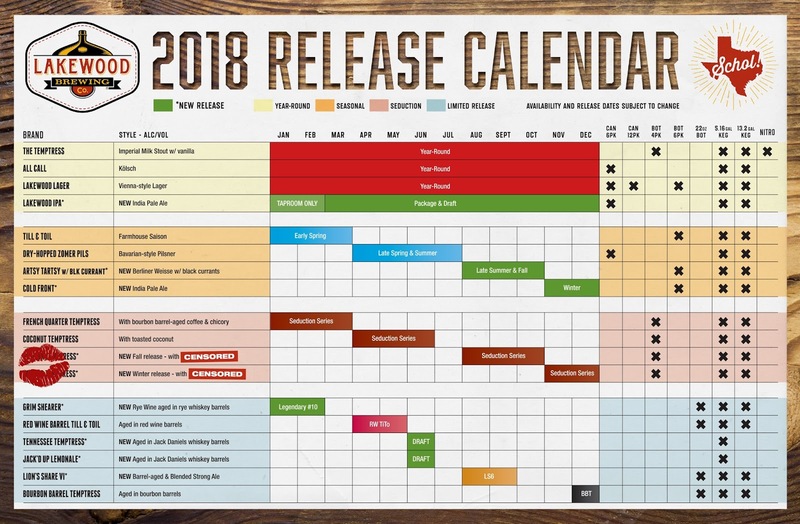 Then further into 2018, consumers can look forward to Lion’s Share VI, a blended, barrel-aged strong ale slated for summer, and the next Bourbon Barrel Temptress vintage, which is on tap for winter. On top of all that, two collaborations with Jack Daniel's Distillery will debut this summer in the form of Tennessee Temptress and Jack’d Up Lemonale, both of which will be draft only. For a complete summary of what's in and what's out for 2018, click here to visit the blog on Lakewood's website.